Way ahead of ya! We actually have something like this already scheduled. Be sure to check Wednesday's news. It might not be terribly obvious until you see the item's name, however... hehehe. Inspiration can come from all sorts of places -- exploring Neopia, a scene from a book or a movie, even the lyrics in a song. All you need is a tiny seed to get a great story going. The problem, of course, is finding that seed. You'd be surprised how much of the writing process is just staring off into space, mentally sifting through all types of thoughts until that little spark of a story shows itself. Of course, the story really takes off when the player entries start rolling in! One does not simply walk into the Darigan Citadel! One must first knock on the front door. Honestly, were you raised in a barn? Ha! Like we're gonna tell. You already got your hint for this decade. Hmm... this is the type of information Mr. Insane would have. Let's see what he says! Mr. Insane: The Lever of Doom has been experiencing cash flow problems ever since the Neopian credit market crashed in Year 9. As a result, it has been acquired in a leveraged buyout by a consortium of private investors, who wish to remain anonymous so that their nefarious misappropriation of Lever of Doom funds will remain undetected just long enough for them to retire to Krawk Island. Consequently, even if we knew exactly how many Neopoints were spent on the Lever of Doom, a veritable army of highly-paid attack lawyer drones would leap upon us and tear us to pieces like deranged Werelupes if we told. So, to answer your question: four. oO Ahem... yes, well. Uhh... there you have it? Eek! We certainly don't want to stress out the faerie at the Healing Springs with bizarre invisible-tree related injuries. We've inquired about this issue and hopefully it will get fixed shortly. Until then, might we suggest a helmet of some kind? It will not change. The Gallery Spotlight basically takes a code snapshot of the items you have when we spotlight the gallery. Any changes in items after that will not be reflected after that point. You may sign your Neopets-themed artwork or put your own symbol on it to show that it is your work, but an actual copyright symbol should not be applied. Please remember that applying the copyright symbol to any art makes us unable to spotlight that art piece in any area of the site. 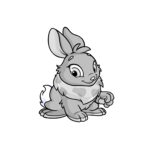 Chocolate is a special, rare Neopet colour that can only be acquired through a lucky shot with the Secret Lab Ray or by receiving a quest from the Rainbow Fountain Faerie. Wow, now that's one evil idea. You should apply to work for us, hahaha!